Partaking in my usual Sunday night ritual of painting a new mani for the week, I stared at my polishes and was uninspired. I’m always looking for new ideas for my diy manis, and usually, they come to me quickly. But, sick of my standard lines and dashes, I turned to one of my favorite nail blogs, Miss Ladyfingers, for inspiration. If you don’t know about her, then you are seriously sleeping on some sick nail art. 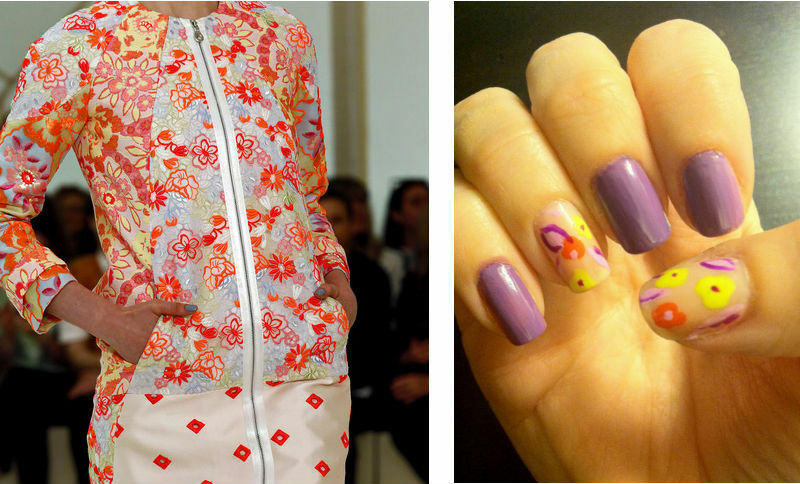 She features DIY nail art inspired by fashion on the runway. After looking at her site, I decided to find some inspiration of my own. Eureka! Erdem’s Spring RTW 2013 runway show, featuring uber bright florals with nods to the 70s. Described by Style.com as “nuclear orange” I immediately wanted to replicate the flowers on this dress. To create the flowers, I simply dabbed a dot 3-4 times in clusters using Zoya’s Heidi (orange) and Orly’s Glowstick (a fluorescent yellow). The hints of light and dark purple on the petals were done using ultra thin Color Club polishes. And the base purple is Iris I Was from Sephora by OPI.